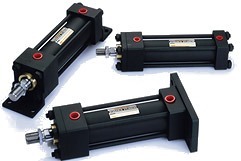 Hanna Cylinders - Fluid Dynamics Midwest Inc.
Today, many industrial applications demand more from hydraulic and pneumatic cylinders than ever before. Greater pressures. Higher speeds. Closer tolerances. Zero leakage performance. Servo/proportional system response. Meeting these high performance demands requires true premium-quality cylinders…such as the product line offered by Hanna Cylinders! For nearly a century, Hanna has earned a reputation as industry innovators. We continually strive to stay on the leading edge of motion control technology by utilizing the latest in state-of-the-art designs and materials in our products. 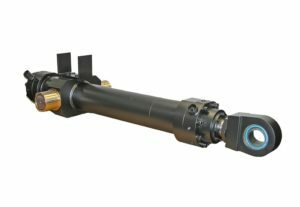 Whafs more, only Hanna offers a single source for tie-rod, mill-type and rotating cylinders, and custom-welded units through our TJ. Brooks Division. the unique Duralon rod bearing that lasts five times longer than traditional bearings, sustains much higher compressive loads, and requires no lubrication to the bearing surface. Glyd-Ring and wear strip piston sealing system that provides sealing capabilities of U-cup seals with wear performance approaching metal piston rings, and fatigue-resistant piston-to-rod connection for optimum strength. Series 3L Medium-Duty Hydraulic – For service to 1,800 p.s.i, 24 mounting styles, 1.50″ through 6.00″ bore sizes. n>Series 2H Heavy-Duty Hydraulic – For service to 3,000 p.s.i. and beyond, 22 mounting styles, 1.50″ through 14.00″ bore sizes. Series 3H Large Bore, Heavy-Duty Hydraulic – Pressure rated at 3,000 p.s.i., seven mounting styles, 10.00″ through 24.00″ bores. Series 3A and SAN Heavy-Duty Pneumatic – Air service to 250 p.s.i., 22 mounting styles, 1.50″ through 14.00″ bore sizes. For non-lube service, select Series SAN cylinders. FORCE 10 Marine Cylinders – For marine, sub-sea and offshore service. Utilizing company-wide resources, Hanna provides design, engineering, manufacturing and project management for highly sophisticated cylinders that meet extremely stringent design standards. More and more, they are the cylinders of choice for critical applications in severe environments. 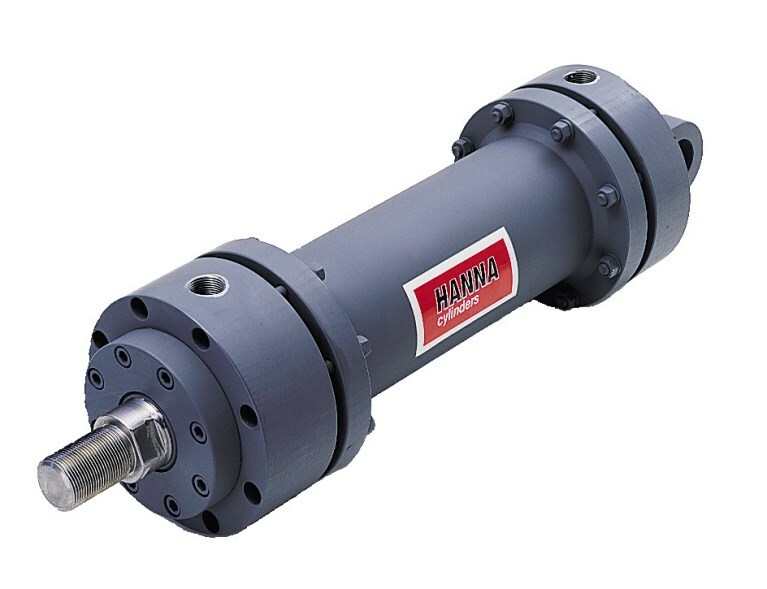 Series RT Rotating Cylinders – Hanna’s heavy-duty hydraulic rotating cylinders provide optimum performance wherever rotation and linear actuation interface. 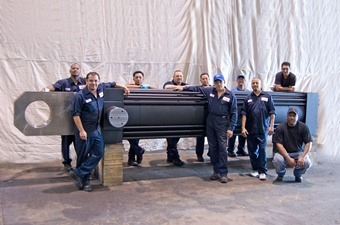 Applications include recoilers, uncoilers, tension reels, transfer line spindles and power chucking on machine tools. Designed for up to 500 RPM, with p.s.i. ratings to 1,500. Available flush or flange mounted, with standard bore sizes from 4.00″ through 16.00″. 20 GPM and 45 GPM couplings are offered. Series MT Mill-Type Cylinders – These are extra-heavy-duty hydraulic units specifically designed and built for extra-demanding applications. Engineered for 2,000 p.s.i. service, Hanna Series MT cylinders are offered in seven mounting styles and 12 standard bore sizes from 2.00″ through 16.00″. 14 standard rod sizes are also offered, with a minimum of two to a maximum of six rod sizes for each bore size. This wide range of standard rod and bore diameters means you can more accurately and economically size the cylinder to meet specific requirements. Series CA Composite Air Cylinders – Corrosion resistance combined with affordability make CA cylinders ideal for many low-pressure (150 p.s.i.) air applications in harsh environments. 11 mounting styles, bore sizes from 1.50″ through 6.00″. Available to meet AWWA specifications. 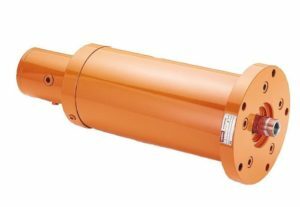 Hanna offers many other cylinder solutions for service in corrosive environments, incorporating a wide range of corrosion resistant materials, special coatings and heat treatments. Beyond the Catalog Cylinders – Hanna has long experience in designing and manufacturing “beyond-the-catalog” special cylinders — on a one-of-a-kind basis as well as production runs. Our “specials” may involve extra-large bore or rod sizes, extra-long strokes, high pressure ratings, special seal design and/or materials, custom mountings, corrosion protection or other unique requirements. We welcome these opportunities to solve difficult motion control problems for our customers! 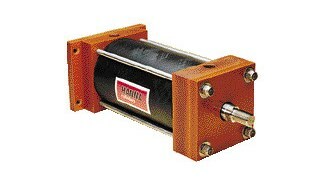 Fluid Dynamics is a Stocking Distributor for Hanna Cylinders.